Bottom Rail - the hem at the bottom of the wrap. It spans the entire length of the wrap. Carry (not labeled) - a combination of passes. For example, Back Wrap Cross Carry, Double Hammock Carry, etc. Middle Marker - small tag in the middle of the wrap's length that tells you where the center of the wrap is located. Only some brands have a middle marker on the bottom rail but all will have one on the top rail. Usually it is sewn into the hem on the "wrong side" of the wrap. Tail - the end points of the wrap. Usually referred to as "long tails" when a lot of the wrap is hanging down after the carry is tied or "short tails" when there's only a bit of wrap left after tying. Top Rail - the hem at the top of the wrap. It spans the entire length of the wrap. Wrong Side (not pictured) - the "back" side of the wrap. 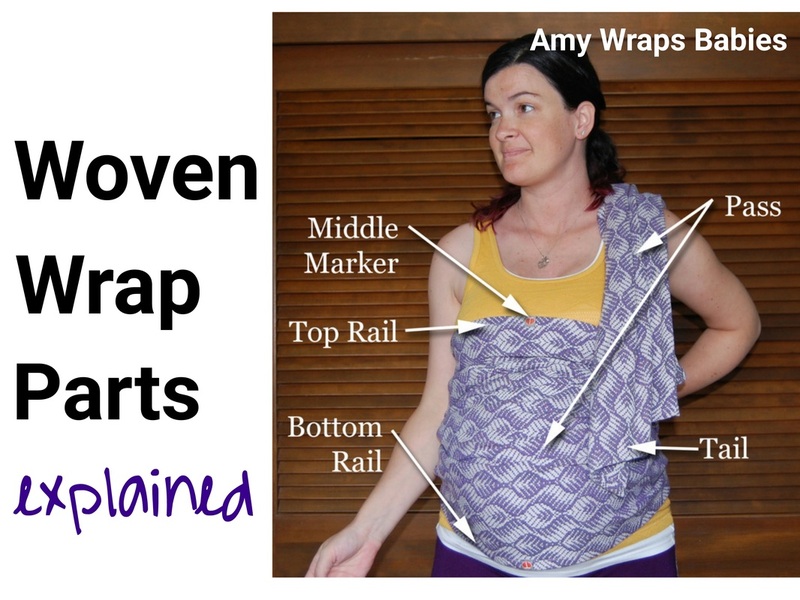 The rail hems fold toward the wrong side and are visible (think of it like the "inside out" of a t-shirt). In some wraps the wrong side contrasts beautifully with the right side which can make some carries look really fancy. Antonym: right side.